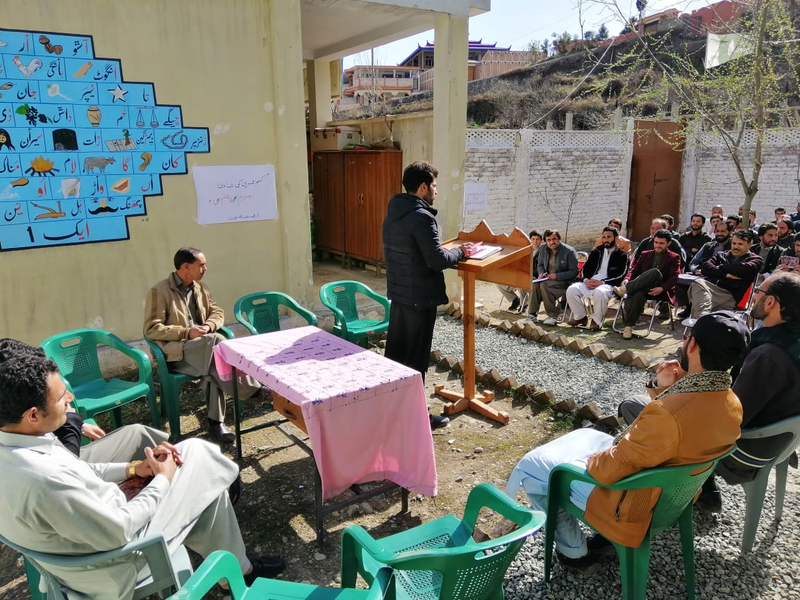 A poetic recitation of the Torwali poetry was jointly held at the lawn of Innovative Learning Model (ILM) School–a mother tongue based multilingual education school– by Idara Baraye Taleem-o-Taraqi (IBT) and Pakistan Village Development Program (PVDP). This event was called Mushaira مشاعرہ i.e a formal literary gathering of poets where they recite or sing their poetry to an interested audience. This event was organized so as to feature, promote and motivate the young speakers of Torwali to not only present their poetic work but also to interact with each other and promote their language and its folklore. More than 15 poets of Torwali presented their poetry while 2 poets of Pashto and another one presented their poetry in Pashto and Urdu respectively. The audience included elders, children, teachers, and social workers. The poets who presented their work were: Abdul Haleem Khan (Torwali), Adil Tofaan (Torwali), Rahim Sabir (Torwali), Javid Iqbal Torwali (Torwali), Sher Muhammad Snr. (Torwali), Sher Muhammad Jnr (Torwali), Ghulam Sadiq (Urdu), Najeeb Zeeray (Pashto), Ashna (Pashto), Ahmad Khan (Pashto), Muhammad Qasim (Torwali), Yasin Torwali (Torwali), Ijaz Dildar (Torwali), Zafarullah Khan (Torwali), Samiddun (Torwali), Noorani (Torwali) and so on. The poetic event was moderated by Javid Iqbal Torwali and Rahim Sabir.